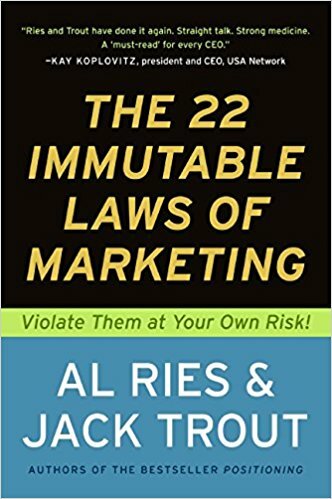 22 Immutable Laws of Marketing is a book by Al Ries and Jack Trout. It aims to present 22 “laws” which it says will cause you to fail if you violate. The first law is that of leadership: it’s better to be first than to be better. It does seem true that often the first company to do something is the leader many years later. You can typically substitute “leading” for “first” to find out how created the market. And it’s true that I can’t name the second person to fly across the Atlantic. Although I was able to name the second person to walk on the moon (Buzz Aldrin). Shane Show argues the opposite in Smartcuts, where he claims research shows only 11% of first movers go on to maintain their status as the market leader. He says the big advantage of being second is that someone else has already figured out how to fix the big problems. The book then talks about the category law: if you can’t be first, come up with a new category you can be first in. This is similar to what Peter Thiel says in Zero to One, where he urges people to carve out a tiny market to dominate rather than taking a small percentage of an existing one. For example, eBay started by specialising in collectables, and PayPal started by targetting eBay power sellers. In terms of differentiation, you need to pick something that will put you on the opposite view of someone else. For example, you can’t say “quality” or “honesty” because everyone wants to say that and nobody will take the opposite view. You need to pick a segment or a view that other companies will disagree with. The book also suggests you should stay specific. They repeatedly use the example of Donald Trump, having no idea he was going to go on to be president 25 years later. They discuss how he was initially successful but then went on to put his name on everything. And when you do everything you stand for nothing. Which is why he was already in $1.4 billion of debt. Many of the books on marketing are timeless: they talk about the basics of human nature and these things don’t change. You would expect a book that talks about “immutable” laws would be the same. But it isn’t. It has dated. It was originally published in 1993 and shows its age. Some of the predictions they make were incorrect, for example. The book claims that USA Today is entering a market too late. But, 25 years later, they’re doing well. They claim that because the market is already owned by other companies, Microsoft will never catch up with Lotus spreadsheets or WordPerfect. Of course, now most people have never heard of these programs and everyone uses Microsoft Office. The idea that line extension is doomed seems somewhat flawed, too. Richard Branson’s Virgin group describes itself as a “brand based capital house” and gets into every market it can stick its name on. Clearly, they have been incredibly successful. It may not dominate the markets it enters, but with £20 billion in revenue it is hard to argue that what they do does not work. There is definitely some good food for thought in there. But whether the game has changed, or whether the knowledge was just misapplied, some of the ideas just don’t fit the facts. So, we can at least conclude that the laws here are not immutable. This entry was posted on Friday, June 8th, 2018 at 11:00 am and is filed under Books, Business & Marketing. You can follow any responses to this entry through the RSS 2.0 feed. Both comments and pings are currently closed.